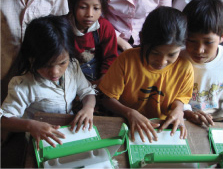 A couple years ago there was a project started that aimed to design and build a laptop for $100 per unit to be given to children around the world, in developing countries, to help flatten the world even more. The design is such that it can be charged by a hand crank or solar power. They’re finally getting them ready to go out the door, but the price has gone up to $200 per unit. You can donate to the project to send a unit around the world, or they’re offering to sell you a unit for $399 with another unit going to some child around the world. We’re a home-schooling family and I’ve been debating purchasing a laptop for our 10 year-old, and while $400 for a $200 machine probably isn’t the best “deal”, the lesson of A) giving to somebody else as well as to him and B) the learning experience of using a play-field leveling device. I know there was a recent study that said you shouldn’t let a kid under two see any TV because it will make them stupid, but frankly, if we can’t trim the brain cells in our kids little bit they’re just going to outwit us for the next 20 years and we’re doomed, DOOMED I say! So, Grace, who is almost, but not quite two, has been allowed to watch Gip-ge (Happy Feet, gip-ge being a version of penguin), Rella (Cinderella), and now Woz (Not Steve Wozniak, The Wizard of Oz). This past weekend we had to “Watchit! WOZ!” about 347 times in a row. I would’ve been fine never seeing Oz again, but at 6:20 this morning the little tyrant came toddling out to the kitchen and told me “Wake! Watchit! Woz! TV!”. If it were a purely passive experience it would probably be worse for her, but easier on me. As it is she bops and dances to each song and when “man!” (the Tin Man) comes on I have to pick her up and mimic the Tin Man dance during “If I only had a heart”. I’m 6′3″ and 235lbs… agile and dancer are not adjectives which apply.